Magic is not separate from any other more readily accessible demonstration of will on nature. Power is a difference of levels, with the more wilful user being able to maintain the greater differential. A strong man can lift the tun higher than the weaker man; the distance from the ground (the null state), is greater and so is he. 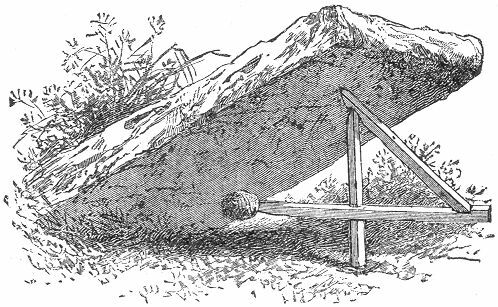 Go into the woods and pile rocks precariously. You leave your energy behind to be spent later when they fall down. Trapping isn't a skill. Being a trapper doesn't give you any innate talent for another culture's trapping tools. 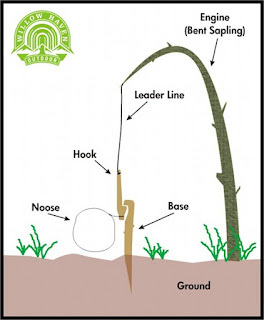 Knowing what a punji stake is doesn't teach you how to dam and poison rivers to catch fish. Knowledge of specific traps is a skill. As long as the trapper is present he may use contributions of stamina from others to pay for the trap(s) if they help. This only covers traps you can make, not complicated mechanical contrivances. Each trap is an Advanced Skill. So Bob can have Wolf Hole 3 and Trapping Pit 1 and so on. The trapper should be as clear as possible with his intentions. Such as "I want to catch rabbits". This is so we know what he's designing it for. A bird-catching Deadfall won't bother a curious coati and the GM will reflect this in the results. Do the Trapping roll in secret. On a Fumble it traps something entirely inappropriate and potentially harmful in some way (such as an angry moose or the Duke's hunting dog), on a Critical it traps exactly what they wanted to trap regardless of the encounter roll. You can check for traps separately or give a +1 bonus for each additional one. Up to the GM. The hunter digs and covers a shallow hole lined with sharp sticks, pointed up to impale or down like barbs to tear. The trap is designed to injure and slow medium sized, heavy stepping creatures like humans. Light footed and narrow legged creatures can expect to avoid them. Any creature injured for 2 or more damage by a stake will have their land movement reduced by half until they can rest for a day and be fully healed. A pit, camouflaged with local detritus, usually several metres deep and a number wide, lined with boards or stones to create a sheer wall to the cavity. Climbing creatures that fall in have one chance to Climb out, failing which they must wait for assistance, starvation or the hunter for relief. Used to guide the desired prey towards other traps. Leading fences might be made of piled up stones over short distances, just high enough to inconvenience deer and encourage them to walk around, or they might be stake fences stretching for miles herding anything larger than a wombat into a great big pit. Each leading fence you build represents a significant length of fencing. For each instance of fencing you may add +1 to your chances of getting something in your trap. Lasts a variable amount of time, depending on the material available. A classic, and an outstanding example of the trappers relationship to magical craft by way of dynamic tension. Obtain a weight of a suitable heft to kill you intended prey. This could be a rock, some boards, or maybe an entire tree trunk. Support the killing piece on a delicately balanced hair triggered lever system like the one pictured and you'll have yourself a universal remote creature flattening device. For each 2 stamina spent making the trap you make multiply the damage it inflicts. So a 6 stamina trap would inflict 3x as much damage, representing the hunter using bigger weights and levers. The snare is similar in principle to the deadfall, but instead of downward, upward. Snares are really only effective against small creatures that can fit their heads in the noose. Anything larger is likely to be either completely indifferent or trapped and injured enough to be dangerous. You can travel 6 leagues per day over even ground; this includes rests, basic scouting about, general awareness etc. Conscientious rambling. Unclear what the terrain should count as? Go down the list and pick the first one that fits. 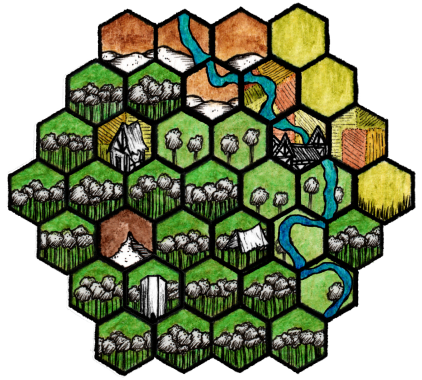 The party wants to enter a grassland hex, along a road, on horseback. This will cost them 1 league worth of movement, rolls of 4 or more result in some sort of encounter, and have a -3 penalty to foraging rolls. They then want to go off road, dismount, and enter a marsh hex. This will cost them 5 leagues worth of movement, thus using their 6 allotted for the day, and have a 1 in 6 chance of an encounter, and a +1 to foraging rolls. Weather can be hot or cold. Cold weather is expressed as a number from 1 to 6, with 1 being cold enough to warrant gloves and a scarf and 6 being arctic temperatures. For each point of coldness a character must fill an inventory space with cold weather clothes. This represents layers of thick clothing rather than many individual pairs of trousers. For each point not filled they must lose 1 Stamina per movement point used. EXAMPLE: Bob is climbing across a mountain (6 movement) which is a bit cold (2). If he was wearing his usual clothes, taking up no inventory space, he would lose 12 Stamina (6x2) doing so. Fortunately he was wearing his bear skins, taking up 2 slots, thus allowing him to ignore the cold. Hot weather is the opposite and ranges from 1 to 6 hotness, with 1 being a particularly warm British summer and 6 being the Sahara desert. Lose Stamina equal to movement points used + armour X hotness. So, if you’re stomping across a swamp (4) in plate (armour 3) at the height of summer (hot 1) you will lose 7 Stamina from being utterly pooped. NOTE: If you are able to sit down and have a meal or somehow else heal yourself above 0, you won’t die from the Stamina loss. It’s assumed to be gradual over the course of the day. Using an appropriate skill the party can gather food. This can be tracking, hunting, foraging, or any other specifically applicable skill. Anyone can declare they are foraging, however foraging members of the party might be at a disadvantage in an encounter, since they are assumed to be roving ahead or behind the party somewhat. If everyone is foraging then they are dispersed, pick someone at random to be the encountered party. If you successfully forage you gain d3 provisions worth of food and water. On a critical success you roll d3+2, on a critical failure you get nothing and also trigger an encounter against your isolated self. On a 6+ there is an encounter. Randomly determine who was awake at the time, assuming they’re taking watches. Sleeping isn’t always easy. The stamina regained from sleeping is modified by the terrain’s restfulness bonus, +1 if there is a campfire. It’s assumed the party rests for 8 hours (the amount needed to heal). For each hour of watching they do, reduce the healing by -1. So if Bob does a 2 hour watch in the desert (-1) he heals 2d6-3 that night. If he stays up all night he gets nothing, not 2d6-9. When do you roll for encounters? On entering a hex and while resting. Roll a d6. On a 6+ there is an encounter. Roll on the encounter table for that hex type. Encounters are pretty common in this system. Make sure they aren’t always a fight. A river, for the purposes of abbreviated cross country travel, is anything you can’t easily wade across. If you want to exit a hex at a hex side blocked by a river then you must cross it. Everyone in the party must make a number of successful swimming tests equal to the size and intensity of the river. Rivers can range from 1 to 6, with 1 being a quick dip in a slow river and 6 being a cold, wide river with undercurrents and steep banks.